My fourth and final feature for National Nutrition Month comes from a fellow dietitian mom who is truly a woman after my own heart: Megan McNamee MPH, RDN, CLT from Feeding Littles. Megan has become one of my most favorite people to meet in the small yet connected online Instagram community of dietitian moms. She is a brilliant dietitian who is respectfully evidenced-based and yet honest and highly-relatable in all of the feeding info she shares. I have learned so much from her over the past year, and I know you all will too with the EASY recipe ideas and kids feeding info she shares with us this week. To note, Megan is also business partners with a very-talented Occupational Therapist and Feeding Specialist, Judy Delaware OTR/L. While Judy may not be a dietitian, I can't help but share some love during this National Nutrition Month for her and all the collaborative work she does to help raise healthier kids. Judy and Megan have truly formed a dynamic duo in the work they do to help families feed their children, and I appreciate getting to constantly learn from the added expertise Judy shares as part of the Feeding Littles team. If you follow Megan on Instagram, you know she is insanely gifted at coming up with easy meal ideas on the fly. She is a working mom with two precious girls and always inspiring me with EASY ideas that are practical to mom-life. That is what became the inspiration for this week's meal plan. Not only does she show what items she buys (see Step 4: PURCHASE below), but she gives the quick prep-free meal ideas all of us moms need when schedules are crazy, appetites are active, and yet we have healthy goals to achieve. A special thanks to Megan of Feeding Littles for the delicious recipe ideas this week! 6 ǁ Pizza Night: Did you know that pretty much every dietitian I know still eats pizza? Fun fact: Megan’s favorite type of pizza is mushroom! She says the more, the better! You know when you see someone who's done something very similar to what you yourself dream of doing "some day"? Well, that's Megan and Judy's Feeding Littles online courses for me. I am so impressed by the quality of content they share in their online Baby Led Weaning Infant course and Toddler course. 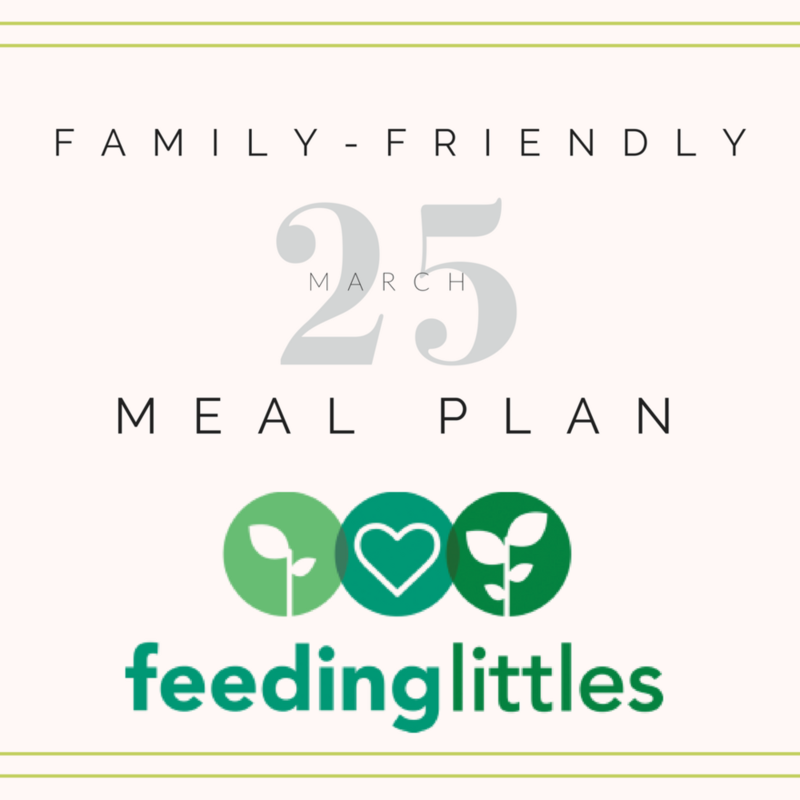 While I try to offer valuable insight on my Instagram posts and in this section of the meal planning posts to help parents better understand how to "pair" meals in a way that works with raising healthy kids INCLUDING picky eaters, I know a lot of moms are seeking more information than I can share all at once (without a one-on-one consult). That's why I love how Megan and Judy have consolidated all of the FAQs and evidence-based information about infant and toddler feeding to create these two unique and yet complementary self-led courses for parents. If you tend to find yourself with questions on how to introduce solids, be sure to read more about their online Baby Led Weaning Infant course. If you find yourself with a child one year or older and have questions about toddler feeding and nutrition, be sure to look into their Toddler course. Both offer video and audio based segments, short enough to fit them in on your crazy schedule and yet comprehensive enough to bring you the insight and action-oriented advice you need to make progress. To get $10 OFF either of the Feeding Littles online course, just use coupon code VEGGIESANDVIRTUE at checkout! One of the reasons I try to feature my grocery hauls and/or favorite products is because I for one know how overwhelming grocery shopping, ESPECIALLY grocery shopping with kids!, can be. That's also one of the reasons I love how Megan shares her tried-and-true meal ideas. Not only does she give you the quick steps to executing, but often she shows the very ingredients she buys and shortcuts she uses to put healthy, wholesome meals on the table. She is practical in what she spends her money on, weighing the nutritional value of foods with the added convenience of having items on hand that help make healthy meal ideas easier. 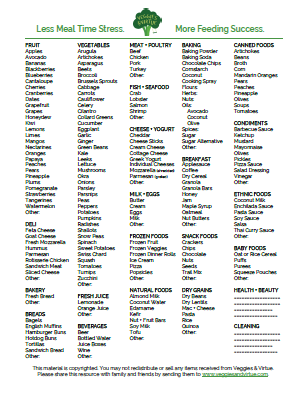 In most of the recipes above, you will get a glimpse at the very ready-made ingredients she herself buys and approves as a fellow dietitian mom! If you would like to know what ingredients/products Megan included on this week's "complete" meal plan (including all the sides offered with the above main courses), be sure to sign up for my newsletter to get the items that accompany each of the items on this week's menu! Unlike last week's 60-minute meal prep game plan, this week is all about prep-free meal ideas. Megan is masterful at finding the ingredients and products that are as good as homemade and yet save you any time from having to prep anything in advance. I always appreciate seeing what meal prep shortcuts she takes, be it using an Instant Pot for quick dinners or ingredients that need little added love to end up as delicious dinners. Although we all get this week is easy on the meal prep, thanks to Megan's effortless-to-execute meal ideas, be sure to check each of them out on the meal plan above or in this week's newsletter for more info on what to make with each night's menu!